WTF of the day: Stupid when hungry. You know how some medicine indicates to not operate machinery when taken, well happy city distractions+hungry=stupidity. Last week after finishing lunch I couldn’t find my keys. 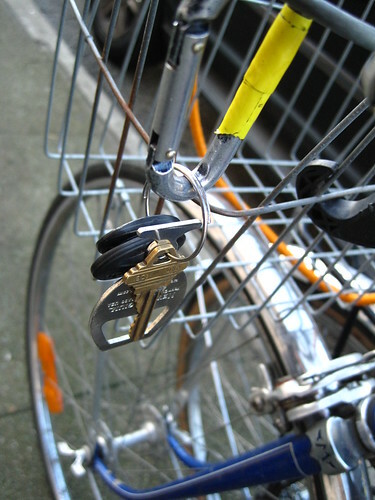 When I walked outside under the suspicion of the scary, I saw my keys clipped to my basket. Dont-ask-me-why. Ummm yea. Not sure what travesty that would have been. Ok dont give me crap for it. Ok maybe. Grrrrrr. Same reason why I have to have coffee before speaking to anyone in the morning…. Have you had any -DU’H- moments while with your bike?! Do tell. Yipes, that is dangerous. My duh moment was when I left my little point and shoot camera hanging from my bell. Luckily, I realized after a couple of minutes because that would not have lasted long. One time I locked my bike up, or so I thought, to a pole outside the boutique I used to work at. My friend came in to visit me and informed me that although I had locked my bike, it was not locked to anything. In fact, when I went outside it was on it's side with a chain going through the frame & wheel. That was a major duh!! moment for me. Luckily no one stole it!! I was once paged to the service counter at Rainbow Grocery because I had not only locked my bike up to the bike rack, but also to the other bike on the rack, and the poor guy couldn't leave…d'oh! That's a pretty good one, Meli! I sometimes document spaced-out lock jobs when I come across them (http://tinyurl.com/yer968g). The other day though, I was super hungry too, but stopped by REI first to get some stuff. When I came out I found that I had “locked” my beloved beater (http://tinyurl.com/y9b2g37) to the bike rack by putting the u-lock around a post but sitting on top of my bike frame. Zoinks! Stan Laural (of “Laural & Hardy” fame) once said “I dreamt I was awake but when I woke up I was asleep”. I'm a walking *doh* moment. I'm pretty sure I was the inspiration for Homer Simpson. Last night I totally spazzed. Got off the train w/ bike in San Jose, walked to the bus stop. Set my bike down and set my bag down. Talked with Kate for a minute a when I realized my backpack isn't on my back! I ran back to the train (still at the platform w/ doors closed), flagged down a conductor who let me on, bag not on the train! Asked conductors if anybody turned my bag in, went back to bus stop with a bad feeling in my gut, and then I notice my backpack right where I left it on the ground next to the bike. thx for the links, nice to hear from you as always! richard/ OMG! I can just see the conductor lookin at you like um you mean the one next to your bike -over there-…. followed some links and randomly came across the blog today, and felt like sharing my very recent moment. 2 days ago my boyfriend was apparently trying to tighten or adjust my saddle with vice grips. when i got up in the morning i didn't notice they were still attached, and rode all the way to work with the pair clamped on, sticking out the side of the seat. durrrhhh. anyways, i dig the blog, it's so colourful! oh man!!! morning are just too funny sometimes..
♥thanks so much for stopping by kelsey!